Infrared waves are part of the range of invisible radiation consisting of wavelengths that range from 750 nanometers to the frequency that goes just beyond the color red in the visible spectrum, meaning it lies between microwaves and visible waves in the electromagnetic spectrum. Far infrared and near infrared waves are both part of this spectrum, although they are very different from each other, and can serve different purposes. Far infrared waves, which are thermal waves, are not visible to the eye, and make up the heat we feel when we're near a fire or standing in the sunlight. In the electromagnetic spectrum, far infrared waves lie closest to the microwave region, and the longest of these waves are close to the size of a pinhead and invisible to the naked eye. Far infrared light has been discovered to have therapeutic properties, and is used in a variety of products for several health-boosting purposes. These waves aid in blood circulation and promote healthy skin, with properties that heal damaged skin and revitalize skin cells. Mineral and heat lamps and select wraps for the knees, ankles or elbows, and certain massagers emit far infrared waves for healing. Far infrared saunas have become popular also, using infrared waves to relieve bodily ailments like high blood pressure and inflammation while detoxifying the body, restoring energy and burning calories. 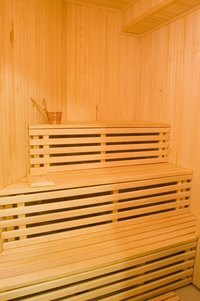 Near infrared waves are also used now in these saunas. While far infrared waves lie closest to the microwave region, near infrared waves are closest in length to the visible light part of the electromagnetic spectrum, and are microscopic in size. Unlike far infrared waves, near infrared waves do not produce any heat. In fact, we can't feel them at all. They are the small waves used by things such as a remote control. Near infrared waves are also becoming popular to use in powering indoor saunas. These infrared waves carry 10 times the energy a far infrared wave does, making it an effective sauna-powering alternative to the far infrared method, as well as others like conventional electricity and steam. It's superior to these other methods because near infrared waves can penetrate deeply into the human body and stimulate cells more easily, making the benefits more readily available. Near infrared waves are also used as analytical solutions for chemical composition in various industries, such as pharmaceutical companies and agrochemical production companies.